A new printing of Red Army Tanks of World War II: A Guide to Armoured Fighting Vehicles of the Red Army has been listed on Amazon by Amber Books. As far as we can tell, this is a reprint of the 2002 book Russian Tanks of World War II: Stalin’s Armored Might published by Zenith Press. Authored by Tim Bean and Will Fowler, this is a 176 page book with numerous black and white photos and illustrations. “Red Army Tanks of World War II” is an authoritative history of Soviet armored forces before 1945, detailing their development, tactics and equipment from the early days of the tank arm in the 1920s, through the purges of the late 1930s and the German invasion in 1941, to the epic tank battle of Kursk, and eventual victory in the streets of Berlin. The growth and development of Stalin’s armored might is illustrated with 170 rare black-and-white photographs, some of which have never been previously published. These include images of tank training in the 1920s and 1930s, photographs taken on active service, and pictures of the major tank battles of the war. The photographs are complemented by detailed artworks of Soviet tanks and exhaustive specifications. A must for any enthusiast, “Red Army Tanks of World War II” is the definitive study of the equipment and tactics of the Soviet armored forces that defeated the might of Hitler’s Wehrmacht. Over at the Archive Awareness blog, Peter Samsonov has posted an interesting summary of data from “Order in Tank Forces: What happened to Stalin’s tanks?” by Dmitriy Shein. In the post, he challenges the commonly held idea that the Red Army had 26,000 tanks at it’s disposal in 1941 versus only 4000 AFVs of the German invader. In a series of charts, Shein shows the number of those tanks that were in the Western districts as well as what state of functionality they were in. When taking into account these various factors, the Red Army had, according to Shein, roughly 7000 – 7500 functional tanks available for battle on June 22nd, 1941. 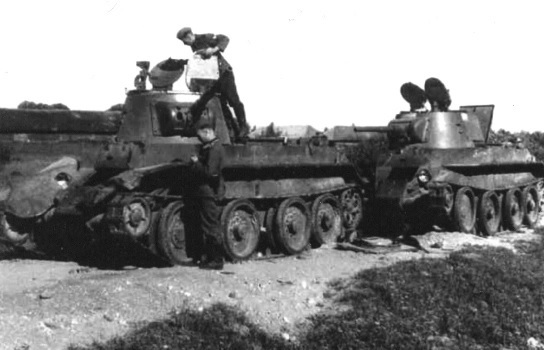 And while that is still a numerical advantage over the tank forces of the German invader, these Red Army tanks of 1941 were hampered by a number of shortages, particularly in fuel trucks and certain types of ammunition. In other words, the tanks of the Red Army were woefully prepared to repel an invader. And while most histories note these issues affecting the “26,000” strong Soviet tank force in 1941, it’s interesting to see the numbers broken and explained.